By Keith Cowing on April 30, 2014 8:46 PM. "A project to build a new super-heavy carrier rocket was included into the draft new Federal Space Program (FSP) Roscosmos chief Oleg Ostapenko said on Thursday. "A [super] heavy carrier rocket was included into the new FSP. Work is still under way, with the first stage envisaging the construction of a rocket capable of lifting from 70 to 80 metric tons," Ostapenko said, adding that such rockets would be enough for projects scheduled for the next 20 or 30 years. The second stage of the project is to build a carrier rocket capable of lifting from 100 to 120 metric tons of payload into the low-earth orbit." By Keith Cowing on April 30, 2014 7:07 PM. "U.S. reliance on Russian engines has been a long-time concern for lawmakers, but those worries have been heightened by Russian actions Washington believes are destabilizing Ukraine. Senators also raised concerns about U.S. dependence on Russian rocket engines at a hearing Wednesday and said they would press for work on an alternate engine. Chief Pentagon arms buyer Frank Kendall told the Senate Armed Services Committee the United States has a license to build the Russian engines itself and could do that if necessary. But he said it would require some technical work first and that the license only goes through about 2022." By Marc Boucher on April 30, 2014 1:55 PM. "The House Committee on Appropriations Subcommittee on Commerce, Justice, Science, and Related Agencies marks up its fiscal year 2015 Appropriations bill on April 30, 2014. The bill contains $51.2 billion in discretionary funding for the Department of Commerce, the Department of Justice, the National Aeronautics and Space Administration (NASA), the National Science Foundation (NSF), and other related agencies." By Keith Cowing on April 30, 2014 11:16 AM. Description - In accordance with this contract, the contractor shall furnish all materials, labor, equipment and facilities, except as specified herein to be furnished by the Government, and shall do all that which is necessary or incedental to the satisfactory and timely performance of the project entitled, "Demolish Shuttle Mate-Demate Device (NB119)," for the National Aeronautic and Space Administration at the Armstrong Flight Research Center (NASA/AFRC), Edwards, California 93523." Keith's note: It would seem that the folks at Armstrong still can't figure out what their name is - or how to properly spell the name of the agency that has run their center for decades i.e. it's "Aeronautics" NASA's Procurement website hasn't figured the Armstrong/Dryden thing out either. By Keith Cowing on April 29, 2014 10:05 PM. "The Committee on Science, Space, and Technology today approved the NASA Authorization Act of 2014 (H.R. 4412) with unanimous bipartisan support. The bipartisan bill reaffirms Congress's commitment to space exploration, both human and robotic, and makes clear that human spaceflight to Mars is NASA's primary goal." "The NASA Authorization Act of 2014 continues the consistent guidance Congress has given to NASA for nearly a decade by reaffirming a stepping stone approach to exploration in a go-as-you-can-afford-to-pay manner by developing an exploration roadmap. It supports the development on the Space Launch System and the Orion Crew Vehicle to push the boundaries of human exploration, and focuses NASA's efforts to develop a capability to access low Earth orbit and the International Space Station so that America can once again launch American astronauts on American rockets from American soil." By Keith Cowing on April 29, 2014 6:46 PM. By Keith Cowing on April 29, 2014 2:27 PM. "ISEE-3/ICE is a satellite that was once used to monitor space weather, but it's been unused for decades. NASA doesn't want to spend the money to bring it back to life, but Cowing and his colleagues are determined to do it. If they can raise $125,000 on a crowdfunding site called RocketHub, Cowing says they'll contact ISEE-3/ICE, wake it up and put it back to good use." Keith's update: We have reached 50% of our goal $62,500. This is the result of 1,032 donors - the vast majority of whom donated between $10 and $50. Our PR has been almost exclusively non-space media. I think this speaks to an interest in space that is outside the usual areas/groups that everyone seems to focus on. Visit the crowdfunding site at Rockethub to help push toward 100%. By Marc Boucher on April 29, 2014 2:19 PM. "The following is the introduction of the complaint filed by SpaceX with the U.S. Court of Federal Claims with respect to the recent EELV contract awarded to United Launch Alliance (ULA). The full complaint is also available for download. 1. The Air Force has entered into an unlawful contract for rocket launches with the United Launch Alliance ("ULA"), a joint venture between the government's two biggest and most influential contractors, Boeing and Lockheed Martin ("Lockheed"). This complex and exclusive deal (the "ULA Contract'), which was concluded outside of public scrutiny, funnels hundreds of millions of U.S. taxpayer dollars to Russia's military-industrial base, including monies that may flow to individuals on the U.S. sanctions list. Further, it defers meaningful free competition for years to come, costing taxpayers billions of dollars more. Beyond violating core tenets of government procurement law, the ULA Contract is dangerous, fiscally irresponsible, and offensive to American values of open competition and fairness." By Keith Cowing on April 29, 2014 12:17 PM. "The U.S. State Department on April 28 said it would deny requests to export defense hardware and services -- categories that under the U.S. Munitions List include satellites and satellite components -- to Russia as part of expanded U.S. sanctions aimed at reversing Russia's incursion into Ukraine if the exports "contribute to Russia's military capabilities." The new policy would appear to complicate a major lobbying effort that U.S. companies had been preparing to exclude at least some civil and commercial satellites from being denied a launch on Russian rockets." Keith's note: This is getting very, very close to the things that NASA ships to the ISS on Progress and Soyuz. "Following the announcement, ]Dmitry Rogozin, the Russian deputy prime minister] said that fresh US sanctions against Moscow could compromise US astronauts on the International Space Station (ISS). If their aim is to deliver a blow to Russia's rocket-building sector, then by default, they would be exposing their astronauts on the ISS," the Interfax news agency quoted Mr Rogozin as saying in Crimea." "If they [the US] want to make an economic blow to the Russian rocket building industry, then they should consider using a trampoline to deliver their astronauts to the International Space Station," [Russia's Deputy Prime Minister in charge of space and defense industry] Dmitry Rogozin said." "The United States introduced sanctions against our space industry... We warned them, we will reply to statements with statements, to actions with actions," he wrote on Twitter." Keith's update: This doesn't help. "Trampolines" are not listed on the GSA schedule. By Keith Cowing on April 29, 2014 12:00 PM. "... because of budget reductions and the loss of other expected revenue, in FY 2016 the Space Network will not have sufficient funding to meet all planned service commitments. Although NASA agreed to provide free access to Space Network services for some customers beginning in FY 2014 in exchange for their contributions to the design and development of two satellites several years earlier, the Agency failed to adequately plan for the resulting approximately $70 million per year in lost revenue. Consequently, the Space Network has a projected $63 million budget shortfall in FY 2016 and even larger estimated shortfalls in subsequent years." By Keith Cowing on April 29, 2014 10:39 AM. "NASA is developing the capabilities needed to send astronauts to an asteroid by 2025 and Mars in the 2030s. NASA Administrator Charles Bolden and other agency leadership will showcase NASA's human exploration path to Mars at an Exploration Forum from 12:30 to 3 p.m. Tuesday, April 29. The forum will be held in NASA Headquarters' Webb Auditorium at 300 E St. SW in Washington. The event is open to the public and will be carried live on NASA Television and the agency's website." "Get an inside look at NASA's next steps in deep space exploration -- from the space station, to an asteroid and on to the human exploration of Mars." By Keith Cowing on April 29, 2014 10:35 AM. By Keith Cowing on April 29, 2014 9:25 AM. "I want America to beat China back to the Moon and be the first to Mars. I want the international community - countries that share our interests and values - working with the U.S., not the People's Liberation Army, on their exploration programs. But this requires vision and leadership. Congress can only do so much without the White House, and unfortunately I don't see that happening under this president." By Keith Cowing on April 29, 2014 8:30 AM. "It is being billed as a merger of equals to create a new company called Orbital ATK. At first glance it appears to be a reaction to the current state of the market with consolidation and future growth needing a larger more competitive entity." Orbital & ATK's Aerospace and Defense Groups to Combine in $5 Billion Merger-of-Equals to Create "Orbital ATK"
"Orbital Sciences Corporation (ORB) today announced that it has entered into a definitive agreement with Alliant Techsystems Inc. (ATK) , which will combine Orbital and ATK's Aerospace and Defense (A&D) Groups to create a $4.5 billion (combined calendar year 2013 annual revenue), 13,000-person space, defense and aviation systems developer and manufacturer. The new company, to be called Orbital ATK, Inc., will serve U.S. and international customers with leading positions in the markets for space launch vehicles and propulsion systems, tactical missiles and defense electronics, satellites and space systems, armament systems and ammunition, and commercial and military aircraft structures and related components. As part of the transaction, ATK will spin off its Sporting Group, which focuses on commercial sporting equipment, to its shareholders." By Keith Cowing on April 28, 2014 6:59 PM. "Defense Department officials have recently stated that cancelling the contract and terminating the block buy - which involves hundreds of suppliers and is enormously complex - would cost billions. Additionally, it could put critical mission schedules at risk that would have impact on operational capabilities and the satellite program costs. ULA is focused on delivering on all of its mission assurance and cost reduction commitments that support its customers." "SpaceX announced today that they are filing a legal challenge to the U.S. Air Force's latest Evolved Expendable Launch Vehicle (EELV) contract with United Launch Alliance (ULA), a joint venture of Boeing and Lockheed Martin. The long-term contract, which guarantees the purchase of 36 rocket cores from ULA to be used in national security launches, was granted to ULA on a sole-source basis without any competition from other launch providers. SpaceX is seeking the right to compete for some of these same launches." By Keith Cowing on April 28, 2014 4:56 PM. "Administrator Charles Bolden has announced several changes in NASA's senior leadership. Lesa Roe has been named as the agency's Deputy Associate Administrator. Steve Jurczyk will replace Roe as Director of NASA's Langley Research Center in Hampton, Va. Sumara Thompson-King has been named the agency's General Counsel, replacing Michael Wholley, who is retiring." By Marc Boucher on April 28, 2014 2:56 PM. "Water filtration bottles, comfortable car seats and remote medical monitoring devices all have one thing in common -- they all have benefited from NASA technology. These products are featured in Spinoff 2013, an online publication now available that highlights commercial products created using NASA-developed technology. Also featured in the 2013 edition is an air purification system that can sustain miners in the event of a disaster, a solar-powered vaccine refrigerators saving lives in remote areas throughout the world, and a powerful heat shield used on the first commercial spacecraft to successfully achieve orbit and return to Earth." By Keith Cowing on April 28, 2014 10:38 AM. "U.S. Senator John McCain (R-AZ) today sent two letters regarding the Air Force's Evolved Expendable Launch Vehicle (EELV) program - a vital $70 billion national security space-launch program that, without competition, has been plagued by exponential cost growth and schedule delays. The first letter is to Secretary of the Air Force Deborah Lee James requesting additional information about her recent testimony regarding the EELV program before the Senate Armed Services Committee on April 10, 2014, and conveying concern about the apparently incomplete and incorrect nature of some of that testimony. The second letter is to the Department of Defense Inspector General Jon T. Rymer requesting that his office investigate recent developments regarding the EELV program." By Keith Cowing on April 27, 2014 6:48 PM. "The International Sun/Earth Explorer 3 probe was originally launched in 1978, and in the decades since it has studied solar winds and magnetic fields and even flown through the tail of Halley's comet in 1986. NASA used the craft for all kinds of studies over the years, until it was decommissioned in 1999." "So what happens once communication is re-established with ISEE-3? With 12 of its 13 scientific instruments still working (at least as of 1999), the research team hopes to turn the spacecraft and its instruments over to the public by creating an app that allows anyone access to its data." Keith's note: The project just passed the $50,000 mark. More than 840 people have donated - the vast majority making donations in the $10 - $50 range. For more information, have a look at the ISEE-3 Reboot Project crowdfunding page. By Keith Cowing on April 25, 2014 10:07 PM. "Due to unexpected personal conflicts, Dr. Michael Meyer has declined the position of NAI's Interim Director. Dr. Meyer explains, "Unfortunately, the requirements levied to resolve a conflict-of-interest were unacceptable." By Keith Cowing on April 25, 2014 8:24 PM. Keith's note: This NASA Langley procurement notice modification is a classic example of a broken government process. Read it carefully. What is/isn't this modification modifying/not modifying? This is a modification to the synopsis entitled [ENTER TITLE AND SOLICITATION NO.] which was posted on [ENTER POSTED DATE]. You are notified that the following changes are made: [ENTER DESCRIPTION OF MODIFICATIONS]. The due date for responses [INSERT is OR is not] extended. Offerors are responsible for monitoring this site for the release of the solicitation and any amendments. Potential offerors are responsible for downloading their own copy of the solicitation and amendments (if any). By Marc Boucher on April 25, 2014 2:41 PM. "In a news conference held at the National Press Club in Washington SpaceX CEO Elon Musk started off by outlining the recent success of the soft landing of the Falcon 9 first stage off the coast of Florida. He then dropped a bombshell aimed straight at the heart of Washington with news that he was going to protest and sue over the recent sole sourced Evolved Expendable Launch Vehicle (EELV) contract won by United Launch Alliance (ULA)." Marc's note: I've included the full audio from the news conference. 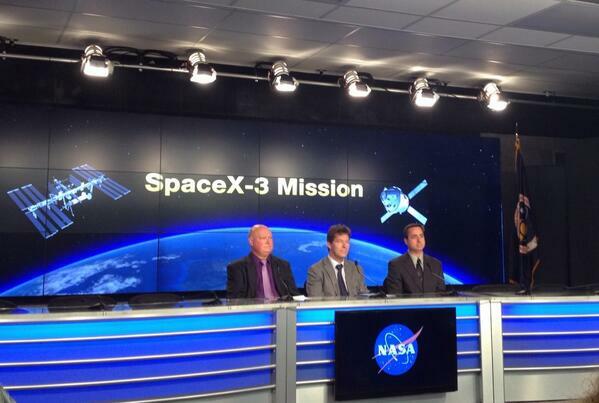 The first half of the news conference relates to the soft landing of the Falcon 9 first stage. Then Elon Musk begins to discuss the legal action started by SpaceX. By Keith Cowing on April 25, 2014 12:34 PM. Elon Musk is making some big SpaceX announcement today (Friday) in Washington at 1:00 pm ET. Will provide more info when I get it. Keith's update: From SpaceX; "Elon Musk will make an important SpaceX announcement today, Friday, April 25th at 1:00PM ET at The National Press Club - 529 14th Street, NW - Washington, DC." We'll live tweet at @NASAWatch - Marcia will no doubt be busy at @SpcPlcyOnline too. Continue reading Big SpaceX Announcement Today?. By Keith Cowing on April 25, 2014 9:26 AM. Keith's note: NASA complains about not having enough money for education and public outreach -- but they can afford to pay $40,000 for lapel pins that they will just hand out to NASA employees, contractor personnel, and @NASASocial attendees. By Keith Cowing on April 24, 2014 11:45 PM. "Wingo and Cowing started a RocketHub crowdfunding effort to raise $125,000 for the mission. They've also been hunting for the right parts to get the communications systems back online. "I was Dumpster diving at a storage unit with Bob Farquhar last week, pulling stuff out of boxes, and I FedExed a $200 overnight box to California," Cowing says. And like they did with the Lunar Orbiter Image Recovery Project, they've been able to tap in to the expertise of the original mission specialists, as well as a robust online community that seems quite adept at making the right documents appear when they're needed." "The hackers behind the Lunar Orbiter Image Recovery Project have moved on to a different challenge. Not content with images, this time they want to recover a whole spacecraft. The ISEE-3 probe was launched in 1978." "Good news is, the team is led by Dennis Wingo and Keith Cowing, who have some serious credentials under their belt. These long-time collaborators head the Lunar Orbiter Image Recovery Project, which digitizes analog data tapes from unmanned lunar orbiters sent to space in the 1960's. Also, Wingo is the founder of Skycorp, which has developed equipment for NASA and DARPA in the past, while Cowing is former NASA employee." "A band of space hackers and engineers are trying to do something never done before -- recover a 36 year old NASA spacecraft from the grips of deep space and time. With old NASA documents and Rockethub crowdfunding, a team led by Dennis Wingo and Keith Cowing is attempting to steer ISEE-3, later rechristened ICE, the International Cometary Explorer, back into an Earth orbit and return it to scientific operations." Keith's update: Our team member Mike Loucks at Space Exploration Engineering has produced this video showing how ISEE-3 will be returned to a useful orbit. You can view the video here. By Marc Boucher on April 24, 2014 8:27 AM. "SpaceX has been working on the Raptor methane-fueled rocket engine since 2009. The new engine, a reusable engine is destined to be used in future versions of the Falcon Heavy and in the long term for the notional SpaceX Mars Colonial Transporter. Testing is set to begin within the coming days after the E-2 test stand activation is completed a spokesperson for SpaceX confirmed to SpaceRef." By Keith Cowing on April 23, 2014 8:05 PM. "However, former astronaut Bonnie Dunbar, now also a UH professor, argued that SpaceX and commercial flight are being touted as a solution but that the money being diverted from NASA to fund these endeavors will cost space exploration in the long run. "Industry is not poised to do the kind of research and development we need to do for space exploration," she said." Keith's note: This is typical of the pervasive ignorance that surrounds NASA - and it comes from decades of drinking the Koolaid. Bonnie Dunbar clearly has no idea what other commerical launches SpaceX has (or its long manifest backlog), how much private capital has been invested in SpaceX, or even the nature of what SpaceX does for NASA. It doesn't do the research that she's so worried about. It hauls groceries. Someday it will fly Texans. What these people do up there - with that cargo - is NASA's call. They are buying a ride. Given the $500 million to $1 billion cost per launch of a shuttle, this is a bargain no matter how you look at it. By Keith Cowing on April 23, 2014 4:40 PM. "Sitting incongruously among the hangars and laboratories of NASA's Ames Research Center in Silicon Valley is the squat facade of an old McDonald's. You won't get a burger there, though-its cash registers and soft-serve machines have given way to old tape drives and modern computers run by a rogue team of hacker engineers who've rechristened the place McMoon's. These self-described techno-archaeologists have been on a mission to recover and digitize forgotten photos taken in the '60s by a quintet of scuttled lunar satellites. The Lunar Orbiter Image Recovery Progject has since 2007 brought some 2,000 pictures back from 1,500 analog data tapes. They contain the first high-resolution photographs ever taken from behind the lunar horizon, including the first photo of an earthrise (first slide above). Thanks to the technical savvy and DIY engineering of the team at LOIRP, it's being seen at a higher resolution than was ever previously possible." By Keith Cowing on April 23, 2014 10:23 AM. By Keith Cowing on April 23, 2014 10:16 AM. "Musk and Gass appeared March 5 before the Senate Appropriations defense subcommittee to answer lawmakers' questions and, in an unusual twist, were given the opportunity to submit written questions to one another and provide answers back to the panel. Neither side landed a knockout blow, but the exchange was illuminating nonetheless." By Keith Cowing on April 23, 2014 9:46 AM. ... But our current trajectory won't get us there anyway; estimates of the cost of a human trip to Mars run into the hundreds of billions. "We're going to have to figure out ingenious ways to do it based on the present budget plus modest increases," Bolden said at the summit. Or maybe more than modest. William Gerstenmaier, NASA's associate administrator for human exploration, told the same audience of the need to "break the paradigm" of current funding. "We cannot do it at the same budget level we're at today. It's just not going to work." By Keith Cowing on April 22, 2014 10:57 PM. 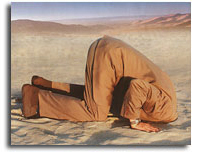 "We do not yet know how the Senior Review will turn out. NASA is famous for wanting to "move on" to the next thing and often abandons working spacecraft. A bird in the hand is worth two in the bush but as things currently stand, there isn't much in the mission pipeline to move on to. Planetary Science has taken several massive budgetary hits in the past few years, with more on the way. The termination of LRO and MER will not help move new missions off the drawing board. Money not spent on these extended missions will probably slide into SMD's Black Hole of Funding (the James Webb Space Telescope) or be dissipated on new paperwork, committee meetings and concept studies. It would be both fiscally prudent and programmatically responsible for NASA to fund and retain these working and still productive extended missions." By Marc Boucher on April 22, 2014 9:38 PM. "Administrator Charles Bolden outlined NASA's human exploration path to Mars during a keynote address at the April 22 Humans to Mars Summit 2014, held at George Washington University in Washington." Marc's note: Bolden didn't say anything that we haven't heard before. He talked about the need for humanity to become a multi-planet species for survival and that the audience needs to face facts that we're in a very constraining budget period. By Keith Cowing on April 22, 2014 3:16 PM. "Long before man journeyed to the moon and looked back at the tiny, fragile planet that houses humanity, remote orbiters were sending back pictures of home. Sent to scope out potential landing sites on the Moon, the series of five Lunar Orbiters also sent back the earliest views of Earth from another celestial body. This image, taken in 1966 by Lunar Orbiter 1, is among the first views of Earth from the Moon. In the black-and-white image, a crescent Earth floats majestically behind the lumpy surface of the Moon." By Keith Cowing on April 22, 2014 1:12 PM. "The B612 Foundation will hold a press conference today which will be webcast from the Seattle Museum of Flight today. The press conference will feature the following new video of data from a nuclear-test-ban-treaty organization showing multiple atomic-bomb-scale asteroid impacts on Earth since 2001. You can watch the press conference below starting at 2:30 p.m. EDT." By Keith Cowing on April 22, 2014 11:33 AM. Keith's note: @NASASocial is retweeting lots of selfies today (this is one of the ones they decided to retweet). Instead of trying to raise issues relevant to Earth Day, NASA is turning the #Globalselfie thing into posting selfies of people and their pets. They could have easily tweeted a little guidance to people and ask them to highlight issues that affect Earth, the environment, climate change. They could also post links to specific projects that NASA is doing in this regard ... or organizations working to address these issues - but no, that takes strategic thought. Why think too hard, @NASASocial? Just post selfies. By Keith Cowing on April 22, 2014 9:46 AM. Keith's note: You know that there is indeed a "there" there vis-a-vis the viability of space commerce when companies start trash talking their competitor's products. By Keith Cowing on April 22, 2014 8:33 AM. "Despite ongoing sanctions, Russia is about to get a big infusion of cash from the U.S. government. NASA recently renewed a contract that allows Russia to ferry U.S. astronauts to the International Space Station. The U.S. is, essentially, cutting Russia a $457.9 million check for its services -- six seats on a Russian Soyuz spacecraft, training and launch prep, landing and crew rescue and limited cargo delivery to and from the International Space Station. This contract also adds additional support at the Russian launch site. NASA has announced it is cutting some contacts with Russia after the country annexed Crimea, including meetings and teleconferences." By Keith Cowing on April 21, 2014 4:40 PM. "At the last SBAG meeting, it was implied that the Dawn at Vesta Participating Scientist Program had not been fully successful. To gain insight into the issue, SBAG undertook a confidential survey of all the U.S. Dawn at Vesta Participating Scientists, receiving responses from 15 of 18 individuals. A sixteenth person did not want to participate. Responses ranged from extremely positive to deeply negative. The details provided indicated no hesitance on the part of the respondents to voice their opinion and provide specifics. Overall, 9 indicated very positive and productive experiences, 4 both positive and negative, and 2 deeply negative. 12 of the 15 respondents would propose to a Dawn at Ceres Participating Scientist Program. While some participating scientists had serious issues, the SBAG survey did not find evidence that the Dawn at Vesta Participating Scientist Program would offer a basis for not proceeding with a Dawn at Ceres Participating Scientist Program." By Keith Cowing on April 21, 2014 12:53 PM. Keith's note: Dan Dumbacher is leaving NASA In June to take a tenured position at Purdue University in their aerospace engineering department. By Keith Cowing on April 21, 2014 12:49 PM. "NASA has selected Kathy Lueders as program manager for the agency's Commercial Crew Program (CCP). Lueders, who has served as acting program manager since October 2013, will help keep the nation's space program on course to launch astronauts from American soil by 2017 aboard spacecraft built by American companies." By Keith Cowing on April 21, 2014 9:35 AM. "We do not suggest that space cooperation with Russia is bad or that it should be totally curtailed or discouraged, but simply that there are elements of U.S. infrastructure that cannot be outsourced indefinitely. We must revitalize America's space infrastructure, and the right place to start is with an advanced-hydrocarbon-fueled booster engine -- an engine critical to U.S. leadership in rocket propulsion for access to space." Keith's note: The authors dismissial of SpaceX progress and their 100% indigenous American engines is odd. The engines exist and are operational NOW. They also seem to be unaware of the much much larger, American-made engines that SpaceX (and undoubtedly Blue Origin) are developing. That said, the authors do make a good point about having non-Russian engines that other American launch vehicles could use. Alas, the authors decline to say who should pay for these new engines. By Keith Cowing on April 20, 2014 11:40 AM. "ISS Commander Koichi Wakata of the Japan Aerospace Exploration Agency, with the assistance of NASA's Rick Mastracchio, successfully berthed the SpaceX Dragon spacecraft at the space station at 9:06 a.m. EDT." By Keith Cowing on April 20, 2014 11:38 AM. "John C. Houbolt, an engineer whose contributions to the U.S. space program were vital to NASA's successful moon landing in 1969, has died. He was 95. His efforts in the early 1960s are largely credited with convincing NASA to focus on the launch of a module carrying a crew from lunar orbit, rather than a rocket from earth or a space craft while orbiting the planet." By Keith Cowing on April 19, 2014 5:02 PM. Keith's update: We REALLY Need this document: GSFC Document ISEE-733-74-001, Revision C, dated 28 June1976 "International Sun-Earth Explorer - A/C, Electrical Interface Specification". Does anyone have a copy? Keith's note: We have had multiple folks ask if we have any received data telemetry tapes from ISEE-3 or the others in the series (ISEE-1 or ISEE-2). If anyone has any of these tapes it would be incredibly useful as we could then feed them into our software radio program. We have the ability to read a lot of different formats as that is what we have been doing with the Lunar Orbiter and the Nimbus data recovery efforts. If anyone has them squirreled away in boxes anywhere it would be great to know about. Send an email to wingod - at - skycorpinc.com if you have any information on possible tapes. By Keith Cowing on April 18, 2014 11:45 AM. Keith's note: There was a huge avalanche at Everest yesterday. So far it seems that 12 people were killed - all Sherpa guides. They were walking up the Khumu Icefall on their way to work. This (link above) is what Scott Parazynski and I witnessed in May 2009. At the time this was described as being a very, very big avalanche for Everest. As such, I can only imagine what yesterday's fatal avalanche at Everest looked like. No one was injured in the avalanche in this video. As I watched this equally huge avalanche (link above) a week later I was almost certain that Scott was in it. We did not know for a while if he was. As it happened Scott and Danuru Sherpa climbed fast and were above the Khumbu icefall when it happened. But Scott's climbing partner Rejean and his sherpa Dawa were caught in it. Dawa's quick thinking saved Rejean's life. Alas, one Sherpa guide was lost in this avalanche. It was a curious existence at Everest Base Camp. I awoke every morning to see the Khumbu Icefall outside my tent flap - calm and serene and always an instant away from becoming deadly. You get used to this - and then again you don't. NASA has its risks and tragedies as well. That said it is always - odd - to watch both cultures (climbing and space) deal with risk. The similarities in risks are often eerily similar yet the ways that the risks are dealt with is often utterly different. FYI I noted this disaprity a decade ago and this led to the Risk and Exploration Symposium that John Grunsfeld and I put together for NASA in 2004. By coincidence, John Grunsfeld was in orbit while Scott and I were at Everest. Life is very fragile - even for the strongest of climbers - or the most skilled astronauts. But that doesn't mean that all risks should be avoided. Many simply need to be confronted. The risks need to be understood and dealt with in a way that safeguards people while still allowing adventure and exploration to continue. Exploration is a risky endeavour - by definition. By Keith Cowing on April 18, 2014 9:34 AM. "Ground controllers at NASA's Ames Research Center in Moffett Field, Calif., have confirmed that NASA's Lunar Atmosphere and Dust Environment Explorer (LADEE) spacecraft impacted the surface of the moon, as planned, between 9:30 and 10:22 p.m. PDT Thursday, April 17. LADEE lacked fuel to maintain a long-term lunar orbit or continue science operations and was intentionally sent into the lunar surface. The spacecraft's orbit naturally decayed following the mission's final low-altitude science phase." @LunarOrbiter Thank you! It's true - there's still loads of science data to crunch through! By Keith Cowing on April 17, 2014 2:00 PM. "In a dim and faraway solar system, astronomers have for the first time discovered a rocky, Earth-sized planet that might hold liquid water -- a necessary ingredient for life as we know it." "San Francisco State University astronomer Stephen Kane and an international team of researchers have announced the discovery of a new rocky planet that could potentially have liquid water on its surface." "NASA will host a news teleconference at 11 a.m. PDT (2 p.m. EDT) Thursday, April 17, to announce a new discovery made by its planet-hunting mission, the Kepler Space Telescope. The journal Science has embargoed the findings until the time of the news conference." By Keith Cowing on April 17, 2014 9:51 AM. By Keith Cowing on April 16, 2014 2:16 PM. "The six new members are Wanda Austin, Wayne Hale, Scott Hubbard, Miles O'Brien, Thomas Young, and Kathryn Schmoll. 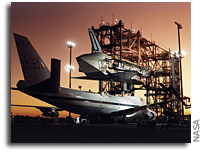 The group has a wide range of expertise in the aerospace field. They are joining NAC Chair Steven Squyres and continuing members Marion Blakey, Kenneth Bowersox, David McComas, William Ballhaus, Charles Kennel (ex officio) and Lester Lyles (ex officio)." By Keith Cowing on April 15, 2014 6:12 PM. "Imagine the heartbroken wailing and the cries of denial. Insert the demands to find out just how much it would cost to rebuild the antennas in time, and the blank stares when told even $1 was outside of NASA's limited budget. Soon, the inevitable idea emerged: crowdfund our way back into communication with the little spacecraft. The idea isn't as crazy as it sounds. " "Where organizations lose their interest--which is to say, funding--the crowd is there to step in. It's true if there isn't money for a Veronica Mars movie, and it's true if the Mars Rover is taking up all of the space agency's cash and attention. An old, even distinguished, NASA spacecraft is coasting toward Earth, but NASA can't afford to bring it back online. That's why a couple of guys want to take on the "geeky endeavor" of bumping it back in to place--with as many 80 year olds as they can find and a satellite dish in Kentucky." "Today, some citizen scientists are investigating whether it would be feasible to communicate with ISEE-3 for the first time in almost two decades in order to send commands to return it to L1. A daunting prospect after all this time with NASA's old friend." By Keith Cowing on April 15, 2014 5:32 PM. "NASA projects have continued to make progress in maturing technologies prior to the preliminary design review. This year, 63 percent of projects met this standard, up from only 29 percent of projects in 2010. For example, in preparation for its upcoming confirmation review, one project has matured all 10 of its critical technologies, which GAO's past work has shown is important to decrease the likelihood of cost and schedule growth. NASA's heightened awareness of reducing technology risk is further evidenced by new guidance aimed at ensuring continued focus on technical maturity. As NASA continues to undertake more complex projects it will be important to maintain heightened attention to best practices to lessen the risk of technology development and continue positive cost and schedule performance." By Keith Cowing on April 15, 2014 3:56 PM. "NASA Kennedy Space Center's historic Launch Complex 39A, the site from which numerous Apollo and space shuttle missions began, is beginning a new mission as a commercial launch site. NASA signed a property agreement with Space Exploration Technologies Corporation (SpaceX) of Hawthorne, Calif., on Monday for use and occupancy of the seaside complex along Florida's central east coast. It will serve as a platform for SpaceX to support their commercial launch activities." By Keith Cowing on April 14, 2014 10:04 PM. "Monday's launch attempt of the SpaceX Dragon cargo craft, loaded with nearly 5,000 pounds of supplies for the International Space Station's Expedition 39 crew, was scrubbed due to a helium leak on the Falcon 9 first stage. The next launch opportunity would be Friday, April 18 at 3:25 p.m. EDT if the issue can be resolved." By Keith Cowing on April 14, 2014 11:00 AM. ISEE-3 Reboot Project (IRP): Our plan is simple: we intend to contact the ISEE-3 (International Sun-Earth Explorer) spacecraft, command it to fire its engine and enter an orbit near Earth, and then resume its original mission - a mission it began in 1978. ISEE-3 was rechristened as the International Comet Explorer (ICE). If we are successful it may also still be able to chase yet another comet. Working in collaboration with NASA we have assembled a team of engineers, programmers, and scientists - and have a large radio telescope fully capable of contacting ISEE-3. If we are successful we intend to facilitate the sharing and interpretation of all of the new data ISEE-3 sends back via crowd sourcing. NASA has told us officially that there is no funding available to support an ISEE-3 effort - nor is this work a formal priority for the agency right now. But NASA does feel that the data that ISEE-3 could generate would have real value and that a crowd funded effort such as ours has real value as an education and public outreach activity. Time is short. And this project is not without significant risks. We need your financial help. ISEE-3 must be contacted in the next month or so and it must complete its orbit change maneuvers no later than mid-June 2014. There is excitement ahead as well: part of the maneuvers will include a flyby of the Moon at an altitude of less than 50 km. Continue reading Help Rescue The ISEE-3 Spacecraft And Put It Back to Work. By Keith Cowing on April 13, 2014 12:28 PM. "NASA Television will air a news conference at noon EDT on Sunday, April 13 at the agency's Kennedy Space Center in Florida. The briefing will provide an update on the status of the SpaceX-3 cargo mission launch to the International Space Station, currently scheduled for 4:58 p.m. Monday, April 14, and on the failure on Friday of a backup computer component that provides redundancy for commanding the Mobile Transporter rail car on the truss of the station." Keith's note: NASA has resolved issues on ISS such that it can safely accommodate Dragon and has cleared SpaceX for their launch tomorrow. Curiously, the banner shown behind the briefers today does not show a SpaceX Dragon (the vehicle actually being launched) but shows a NASA Orion instead. I am told that this was done in "error". OK, that happens. But why is there a NASA graphic of ISS and Orion together in the first place? Orion is not going to visit ISS. Or is it? 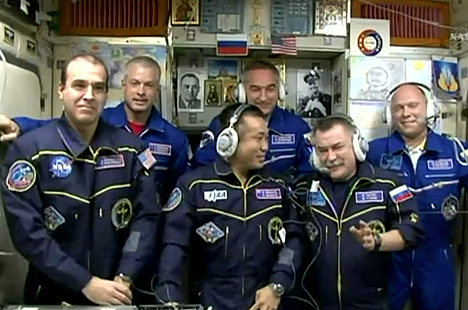 Did American Astronauts Boycott Putin Uplink? By Keith Cowing on April 11, 2014 3:22 PM. Reader note:"This screen capture from today's Space Station Live shows the ISS crew during this morning's call by Vladimir Putin to the ISS. Only Mastracchio & Swanson don't wear audio headsets. Is it some kind of sanction against Russia?" Marc's note: The answer is no. There are only four places to plug in comm sets in the service module. Thanks to an astute reader for reminding us and everyone about this. Keith's note: But NASA PAO has still not responded to our inquiry on this. By Keith Cowing on April 10, 2014 11:51 AM. "In less than a half-hour this morning the Space Subcommittee of the House Science, Space, and Technology Committee approved a bipartisan bill that would establish important policy for NASA. In contrast to last year's markup of an authorization bill that stretched over five hours with many party line votes, the action this morning required just two voice votes, setting up this bill for action by the full committee." "The Space Subcommittee today approved the NASA Authorization Act of 2014 (H.R. 4412) with unanimous bipartisan support. The bill updates the previously committee-approved bill to reflect the funding agreement reached in the Consolidated Appropriations Act of 2014. The Subcommittee also approved a bipartisan Palazzo-Edwards amendment that ensures sustainability of purpose and budget for high-priority NASA programs." By Marc Boucher on April 10, 2014 10:10 AM. "If we're going to send Humans to Mars it should be an international effort where cooperation with the Russia and other partners is essential. However relations with Russia have taken a decided cold turn of late including barring NASA from working with Russian colleagues unless it's directly related to the International Space Station." Marc's note: Includes testimony, audio of hearing and link to video archive. By Keith Cowing on April 9, 2014 11:27 AM. Gerst: when I get down in the dumps about budget I go talk to kids about what we are doing w/existing budget and I get re-energized. Rubio: I think vast majority of Americans are unaware of this program. By Keith Cowing on April 9, 2014 8:04 AM. Sec. 701 Asteroid Retrieval Mission: "Consistent with the policy stated in section 201(b), the Administrator may not fund the development of an asteroid retrieval mission to send a robotic spacecraft to a near-Eaerth asteroid for rendezvous, retrieval, and redicrection of that asteroid to lunar orbity for exploration by astronauts." However a compromise amendment to HR 4412 by Amendment by Rep. Edwards and Palazzo does not include this provision. By Keith Cowing on April 8, 2014 6:53 PM. "Due to the fact that the NASA systems lack the necessary controls to protect information, allow foreign nationals access to the networks, and allow remote access, the Panel concludes that the NASA networks are compromised. Publicly available reports on systemic data breaches across the country, NASA's own internal reports, and briefings given to Academy staff leave little doubt that information contained on the NASA IT systems is compromised." "Our first panel today will focus on issues in NASA's security controls that were brought to light through the work of the National Academy of Public Administration. Governor Thornburgh, a NAPA fellow, led a team of experts in a comprehensive review of NASA security practices, culminating in a report that was issued about two months ago ... To my great frustration, the full contents of those reports are restricted and the publicly available executive summaries are lacking in many of the details and examples that are needed to fully understand the scope of the problem." What Are Real Consequences of NASA's Russia Policy? By Keith Cowing on April 8, 2014 3:52 PM. @jeff_foust What about Facebook and Twitter? Does NASA need to unfriend & unfollow Roscosmos? By Keith Cowing on April 8, 2014 3:09 PM. Keith's note: There was a hearing today titled NASA Request and Oversight of NASA Security, Rep, Frank Wolf (R-VA) and John Culberson (R-TX) spent most of their time dumping on NASA and impugning Charlie Bolden's honesty. Culberson also seems to think that North Korea has an ICBM/time machine with which they can send us all back to 1813 (not certain why North Korea picked that year). Lots of snark in the room. To get an idea of the Twitter stream from the event look at @jeff_foust, @Leone_SN, ‏@b0yle, ‏@Berger_SN, ‏@SpcPlcyOnline, and @NASAWatch. Franck Marchis has created a Storify version of all the Tweets. Here are a few of my NASAWatch favorites. Continue reading House NASA Budget Hearing: Lots of Snark and Insults. By Keith Cowing on April 7, 2014 8:25 PM. "Regarding Congress, she repeated that the key is to "change the tone to change the tide." She wants civility restored to the process, with negotiations taking place "between each other and not in the press." She cited the work she and her Republican ranking member, Sen. Richard Shelby (R-AL), did with their House counterparts in December and January in reaching agreement on the FY2014 Consolidated Appropriations bill as an example of success." "If we are serious about once more launching American astronauts on American rockets from American soil, we must make tough decisions within NASA's budget. Only when the budget has been stripped of costly and complex distractions will it once again reflect the priorities of the sole government agency tasked with space exploration." By Keith Cowing on April 7, 2014 7:23 PM. Keith's note: This NLRB mandated notice was sent to all employees at Caltech/JPL and just appeared as a huge banner on JPL's internal web page. It states: "The National Labor Relations Board has found that we violated Federal labor law and has ordered us to post and obey this notce." The hierarchy at JPL for disciplinary actions is: 1. Oral warning 2. Written warning 3. Final written warning 4. Involuntary termination. 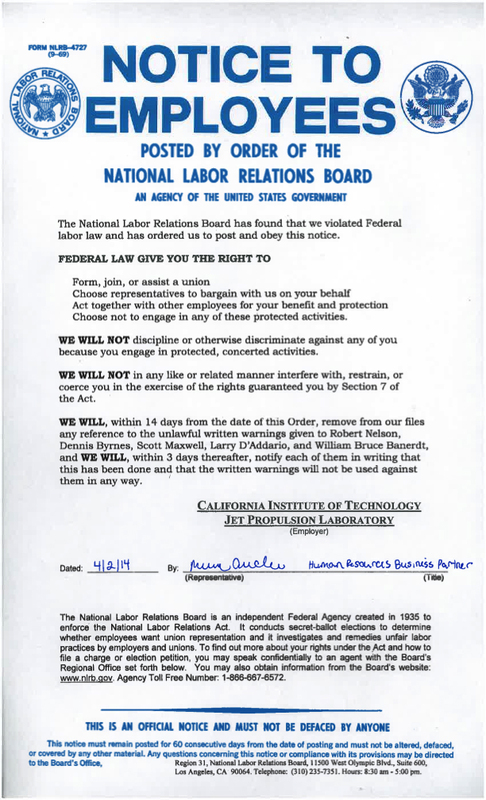 As such, the wording in this formal NLRB notice this clearly indicates that some pro-union activity got the second level of discipline against these people from JPL management - until the NLRB stomped on Caltech/JPL, that is. Click on image to enlarge for full NLRB notice. "By issuing written warnings to Robert Nelson, Dennis Byrnes, Scott Maxwell, Larry D'Addario, and William Bruce Banerdt because they engaged in protected, concerted activities, the Respondent has engaged in unfair labor practices affecting commerce within the meaning of Section 8(a)(1) and Section 2(6) and (7) of the Act. Having found that the Respondent has engaged in certain unfair labor practices, I shall order it to cease and desist therefrom and to take certain affirmative action designed to effectuate the policies of the Act." By Keith Cowing on April 7, 2014 4:42 PM. "... like six other ongoing NASA missions studying the Moon, Mars and Saturn, Opportunity's money is due to run out at the end of the US fiscal year, on 30 September. Managers for each mission are trying to convince the agency to cough up continued funding, and their arguments are due on 11 April. A 'senior review' panel of external planetary scientists will rank the proposals' potential science return, and submit their suggestions to NASA headquarters for a final decision." By Keith Cowing on April 4, 2014 2:09 PM. "We stand at a pivotal moment in space exploration and our ability to improve life on our planet. Humankind is making plans to further extend its reach into the solar system, and NASA is leading the way. Our orbiting outpost, the International Space Station (ISS), is home to a crew of astronauts from across the world conducting research and learning how to live and work in space. " 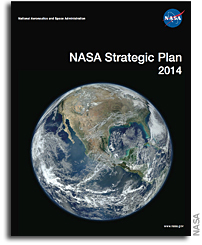 Keith's note: This thing reads like an annual report - there is no "plan" in this strategic plan. The authors are utterly confused as to what a "goal", "objective", and "strategy" are and confusingly use the terms interchangeably. It is almost as if they say "it is important that we do what we are doing because we are already doing it". Also, doing things in a cost-effective and innovative way seems to be some sort of strategic objective preoccupation with the reports' authors. Well, DUH, you should always do such things in a cost-effective and innovative way as a matter of course in ANY project - government or otherwise - not do so as an end in and of itself. It is like saying "our goal is to drive under the speed limit on the right side of the road" as an objective - when your real objective is to travel to a specific location. NASA is bafflingly confused when it comes to form and function, cause and effect, and that the specific managerial process of doing something and actually achieving a specific goal are not the same thing. Then again NASA people often cannot tell the difference between nouns and verbs. Ever hear a NASA person say they are going to "action something"? By Keith Cowing on April 4, 2014 12:57 PM. As retired Astronaut, had to submit FOIA request to get NASA to provide hires pics of me in orbit. They "...don't support formers," anymore. By Keith Cowing on April 4, 2014 11:20 AM. Keith's note: There has been a flurry of comments via Twitter and press releases over the past 24 hours about going to Mars - and what things we can do now to help us to get there. It all started with NASA Administrator Bolden telling an advisory group yesterday that "Inspiration Mars is not Inspirational". He was referring the the latest incarnation of the ever-changing mission idea first proposed by Dennis Tito. This is part of a larger discussion regarding the SLS (Space Launch System), destinations in space, the value of commercial space - all of which was turbocharged by NASA's stealthy direction to its staff to cut off all ties with Russia except those involving the International Space Station. Bolden, the White House, and some Democrats want to do the ARM (Asteroid Retrieval Mission) as a first test of the Orion/SLS system. Republicans and members of Congress from states where SLS/Orion hardware is made want a more robust Mars flyby mission using additional SLS hardware. All of this is fueled behind the scenes by partisan politics and the puppetry by former NASA employees scorned by the cancellation of the Constellation program. And no one in this food fight can point to a clear, cohesive space policy proposal - one with budgets, milestones, and overall goals. Indeed everyone's notional policy is deeply flawed and wholly out of synch with the realities of using the same old approaches to conduct a program of human exploration mandated by the government. But when has that stopped anyone from having a good argument about what the current Administration's policy is - or is not? Indeed that is what this is all about. No one wants to really explore space any more. They just want to argue about it. The argument currently finds itself focused on asteroids Vs Mars. So lets start there. ARM is not without its fiscal problems and fundamental flaws. If the whole idea of ARM is to give Orion/SLS system a test in deep space then they should actually send a crew *to* an asteroid IN DEEP SPACE. Grabbing an asteroid and then bringing it back to a location close to Earth via robot such that Orion can visit it totally undermines the purpose of a deep space test. Its like lowering a basketball hoop to make it easier for you to sink the ball. Your test now becomes a stunt. It would be vastly simpler and less expensive to send a robotic mission to characterize the target asteroid - if asteroid characterization was the main goal. If a true test of Orion/SLS systems in a risky environment - for a first flight - was the goal, then NASA should do just that. But to suggest that a Mars Flyby is a good way to do this test is to run in the exact opposite direction - for a first mission. Operating much closer to Earth ARM has the virtue of providing a contingency return if any critical systems fail on their first flight. Mars Flyby commits to everything with no way to abort. The crew is along for a 500+ day ride no matter what. So ARM is too wimpy and Mars Flyby is too risky. How do we test Orion/SLS? And oh yes, everyone is waving their arms as to whether either mission "helps us get to Mars". Well, if you have already decided that Orion/SLS is the only (preferred) way you want to send humans to Mars then ANY flight has to provide some value. Of course some missions provide more bang for the buck than others. So people saying that it doesn't help us get to Mars are simply playing politics with their preferred mission. The issue as I see it is how you use this absurdly expensive system in a strategic, systematic way that reduces real risk without taking unreasonable risks and demonstrates systems and technologies specifically needed to land people on Mars. You need a firm goal, and a long term plan for what you do once you get to Mars and build backward from what it takes to meet those goals. Here's the problem: NASA has no firm plan, goals, destinations, and it doesn't even have the slightest hint of any evidence that a budget significant enough to make Mars exploration possible is in the cards. "Some time in the 2030s" is not a policy to send humans to Mars. Its a punchline for policy wonks to use. Indeed there is not enough money NOW in order to get started. Moreover, we have one singular government solution (Orion/SLS) irreparably mandated by a collision of meandering policies from successive White Houses with overt pork preservation tactics by Congress. No discussion of alternate approaches is possible. And when one private sector alternate approach appeared (the original Inspiration Mars) it was immediately abducted by big aerospace companies and morphed so as to now justify the Orion/SLS - the very thing it originally sought to eclipse. By Keith Cowing on April 3, 2014 7:10 PM. "In comments before the National Academies, Administrator Bolden today misrepresented a Mars Flyby 2021 mission. The Administrator indicated that a Mars Flyby is not a worthy stepping stone to an eventual Mars landing because it doesn't demonstrate technologies. That is factually incorrect. Experts have testified that a Mars Flyby mission would utilize the Space Launch System, architecture that will be central to a Mars landing. He further contended that the Obama administration's proposed Asteroid Retrieval Mission (ARM) is a better stepping stone to Mars. However, the administration has not provided any details of how it fits into a larger exploration roadmap. The ARM mission lacks support from the stakeholder community and NASA's own advisory bodies. It is a mission without a realistic budget, without a destination and without a certain launch date. I urge the Administrator to get his facts straight when comparing the value of potential NASA missions." Keith's note: Looks like Mike Griffin Dennis Tito Boeing Doug Cooke Chris Shank Lamar Smith is upset that someone has an opinion that differs from the (previously all-private) bait and switch Mars Flyby mission Dennis Tito now wants everyone else to pay for. Oddly, Smith and his pro-Mars Flyby cabal have yet to explain where the money would come from for such a mission - now that taxpayers are funding it. Kudos to Charlie Bolden for being honest. But His plan is equally flawed. Bolden: I don't consider Inspirational Mars inspirational since it doesn't demonstrate anything, doesn't help us to get people to Mars. By Keith Cowing on April 3, 2014 12:32 PM.
.@batchelorshow actually deep space - cis-lunar EVAs were done on Apollo 15,16, and 17. So, #NASA has experience - albeit 4 decades ago. By Keith Cowing on April 3, 2014 8:27 AM. [Agenda register online]. The meeting starts today at 8:30 am but is closed. The public (open) session starts at 10:50 am. Marcia Smith reports that Charlie Bolden will be there. By Keith Cowing on April 2, 2014 9:19 PM. "The choice of a globe as the emblem for North Korea's space agency expresses the country's ideal of peaceful exploration, explains the Korean Central News Agency. The blue rings, it adds, represent satellites, and the constellation of stars shows the desire to "glorify Kim Il-sung's and Kim Jong-il's Korea as a space power". 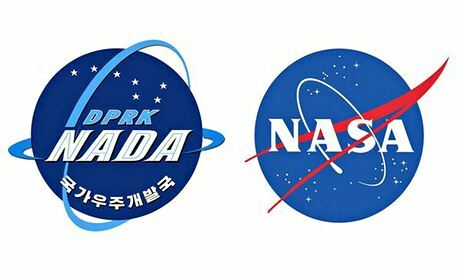 However, the state news agency neglects to mention one glaring thing: the new logo looks a lot like that of Nasa, the space agency of Pyongyang foe's the US, right down to the blue globe, lettering and swooshed ring." By Keith Cowing on April 2, 2014 7:44 PM. Keith's note: An internal NASA memo is circulating that bans all employee contact with Russia except for ISS operations. Stay tuned. "Given Russia's ongoing violation of Ukraine's sovereignty and territorial integrity, until further notice, the U.S. Government has determined that all NASA contacts with Russian Government representatives are suspended, unless the activity has been specifically excepted. This suspension includes NASA travel to Russia and visits by Russian Government representatives to NASA facilities, bilateral meetings, email, and teleconferences or videoconferences. At the present time, only operational International Space Station activities have been excepted. In addition, multilateral meetings held outside of Russia that may include Russian participation are not precluded under the present guidance." "Given Russia's ongoing violation of Ukraine's sovereignty and territorial integrity, NASA is suspending the majority of its ongoing engagements with the Russian Federation. NASA and Roscosmos will, however, continue to work together to maintain safe and continuous operation of the International Space Station. NASA is laser focused on a plan to return human spaceflight launches to American soil, and end our reliance on Russia to get into space. This has been a top priority of the Obama Administration's for the past five years, and had our plan been fully funded, we would have returned American human spaceflight launches - and the jobs they support - back to the United States next year. With the reduced level of funding approved by Congress, we're now looking at launching from U.S. soil in 2017. The choice here is between fully funding the plan to bring space launches back to America or continuing to send millions of dollars to the Russians. It's that simple. The Obama Administration chooses to invest in America - and we are hopeful that Congress will do the same." "On Thursday NASA administrator Charles Bolden reassured lawmakers that Russia won't stop providing access for US astronauts to the International Space Station, despite the current tensions between the two countries over Russia's recent invasion of Crimea." "Several legislators expressed concern that the diplomatic breakdown between Washington and Moscow over Russia's incursion into Ukraine's Crimean peninsula could derail cooperation between NASA and Roscosmos." By Keith Cowing on April 2, 2014 11:16 AM. "NASA should use an ethics framework when deciding whether, and under what conditions, spaceflights that venture outside low Earth orbit or extend beyond 30 days are acceptable if they do not meet current health standards, says a new report from the Institute of Medicine, the health arm of the National Academy of Sciences." By Keith Cowing on April 1, 2014 9:23 PM.
.@NASAWatch: You got it. #NASA and @WhiteHouse prefer to keep the space launches -- and the jobs -- right here in the USA. By Keith Cowing on April 1, 2014 2:28 PM. By Keith Cowing on April 1, 2014 12:00 AM. "A committee of headquarters employees nominated Cowing for an agency award for running the RIF Watch site. But NASA Associate Administrator for Headquarters Operations Michael Christensen, rejected the idea. "The tone of the page is unacceptable," says Christensen. "None of us dispute his right to run the Web site. My own personal decision was that it would be inappropriate to honor him for it." Just to show you how things have changed, this photo should shock a few of you ... (well worth a click) - and no, it is not an April Fool's joke. Today, some up and coming bloggers and Twitterati throw snark at me just like I threw it at Dan Goldin back in the day. Life is funny like that. And those of you who have followed my 'other' exploits will know that I have had a certain interest in doing websites from distant and extreme locations (Devon Island, Everest Base Camp, etc.). This website (still online), "The McMurdo Dry Valleys Long-Term Research Project - Life in Extreme Environments; An Antarctic Field Journal", done with my friend Dale Andersen, was one of the very earliest websites actually updated from Antarctica. This page is an archive of entries from April 2014 listed from newest to oldest.